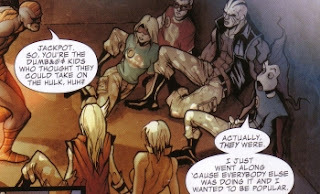 After getting captured by the Hulk and his Warbound the initiates need some rescuing which comes in the form of some of the more mature members of the Initiative. I bought Avengers: The Initiative while it was on sale and admit that I would have paid full price for it had I know it was this good! I highly recommend the first volume and found it one of the better comics to come out of the Civil War storyline. While Slapstick is just trying to be funny with his retort you have to remember that this is a group of teenagers who are still exploring their abilities and the concept of teamwork. Very often, though, we follow our peers against our better judgement and end up in trouble with the rest of them instead of standing up for our beliefs at the cost of being unpopular. References: Taken from Avengers: The Initiative TPB (ISBN: 978-0-7851-2516-7) by Dan Slott (writer) and Stefano Caselli (artist).